Expedia has some amazing Old Harbour vacation packages. Combining your bookings is a surefire way to save time and money — and get your trip off to a flying start. Wouldn't it be nice to earn savings up to C$590*? Purchase your package deal on Expedia now! With more than 400 partner airlines and 321,000 properties to select from on our comprehensive database, you won't have any problems crafting your ideal vacation. Preparing to take off on your Old Harbour vacation? Can't decide what sort of things to put on your travel itinerary? Don't stress — we'll give you a few of our recommendations. Find out when Sunday Mass is held at St Jago de la Vega Cathedral. While you're here, why not take a couple of moments to perch on one of the pews and say a quiet prayer. Adventurers have a great range of options close by. Often haunting and impressive, ruins tell important insights into our history. Find out about the stories behind Courthouse Ruins and exactly why this structure fell into rack and ruin all that time ago. Still have some time to spare? If these walls could talk! Just imagine the countless power grabs and passionate arguments that have occurred at House of Assembly. Check for tours for a closer look at this important building. As there are no Old Harbour properties registered with Expedia, some people find it convenient to stay in Kingston, which is about 20 miles (32 km) away. The Strawberry Hill, The Courtleigh Hotel and Suites, Terra Nova All Suite Hotel, Courtyard by Marriott Kingston, Jamaica, The Spanish Court Hotel, The Jamaica Pegasus Hotel, Kingston Paradise Place Rooms, Eden Gardens Wellness Resort & Spa, Knutsford Court Hotel, Altamont Court Hotel, Hotel Four Seasons, RafJam Bed & Breakfast, The Cabin at Long Mountain Country Club, The Gardens, New Kingston Guest Apartment III, Casa Tianna Guest Apartments, Oakland Guest Apartments, Eclipse Suite Guest Apartments, Chester Avenue Bed & Breakfast, Grand Port Royal Hotel Marina & Spa, New Kingston C.A. 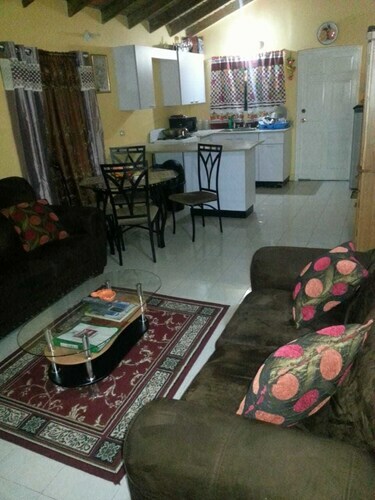 Guest Apartments I, Casa Alexandria Guest Apartment, Sunset Strip Acadia Guest Apartment, Neita's Nest - Jamaican Bed & Breakfast, Jasmine Inn, Reggae Hostel, Lion's Pride - Hostel, Millsborough Guest Apartments, Signature's 21 Guest Apartments, New Kingston Guest Apartments at Seymour, New Kingston Guest Apartment at Westbury, New Kingston Guest Apartments II and Centrally Located Guest Apartments are among the best options in Kingston. Nothing compares to finally arriving at Norman Manley International Airport (KIN) after a lengthy flight. Once you've retrieved your baggage from the carousel and stretched your limbs, you'll be around 20 miles (32 km) from the center of Old Harbour. Located in the heart of Old Harbour, this vacation home is within 25 mi (40 km) of Caymanas Golf and Country Club, Devon House, and Hellshire Beach. Mandela Park and Tropical Plaza are also within 25 mi (40 km). Situated in Old Harbour, this vacation home is within 25 mi (40 km) of Fort Clarence Beach, Hellshire Beach, and Caymanas Golf and Country Club. Devon House and Bob Marley Museum are also within 32 mi (52 km). 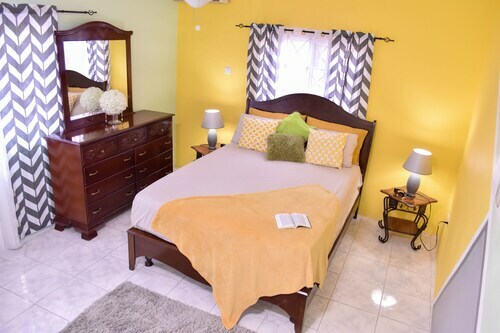 Situated in Kingston, this vacation home is 1.1 mi (1.8 km) from Caymanas Golf and Country Club and within 12 mi (20 km) of Devon House and Emancipation Park. Bob Marley Museum and Hellshire Beach are also within 12 mi (20 km). 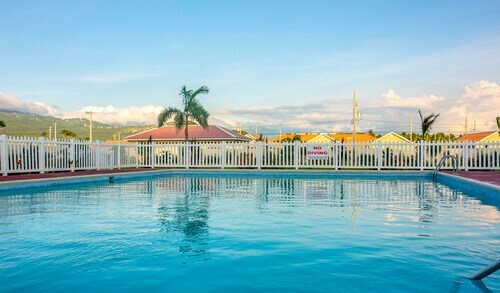 Nestled on the beach, this Portmore villa is within 9 mi (15 km) of Fort Clarence Beach, Hellshire Beach, and Saint William Grant Park. National Heroes Park and Mandela Park are also within 9 mi (15 km). 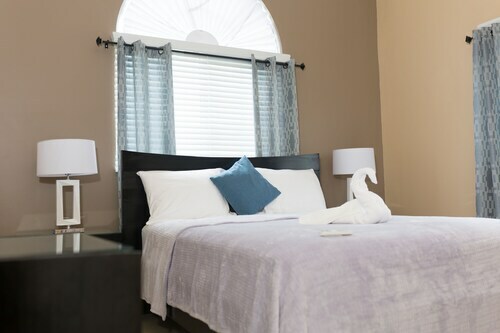 This family-friendly Kingston villa is located near the beach, 0.9 mi (1.4 km) from Caymanas Golf and Country Club, and within 12 mi (20 km) of Hellshire Beach and Sunshine Amusement Complex. 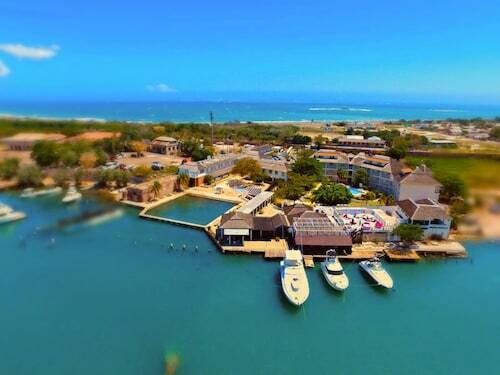 Fort Clarence Beach and Emancipation Park are also within 12 mi (20 km). Situated in Kingston, this golf villa is 1 mi (1.7 km) from Caymanas Golf and Country Club and within 12 mi (20 km) of Devon House and Emancipation Park. Bob Marley Museum and Hellshire Beach are also within 12 mi (20 km). Situated in Portmore, this vacation home is within 9 mi (15 km) of Fort Clarence Beach, Hellshire Beach, and Caymanas Golf and Country Club. Trench Town Culture Yard and National Gallery of Jamaica are also within 12 mi (20 km).